Revelation Two – Monitor MkII is a small sized 2-way stand-mount loudspeaker for small to medium sized listening rooms. It offers several tuning options like two different bass-reflex tunings as well as tweeter tuning options.. 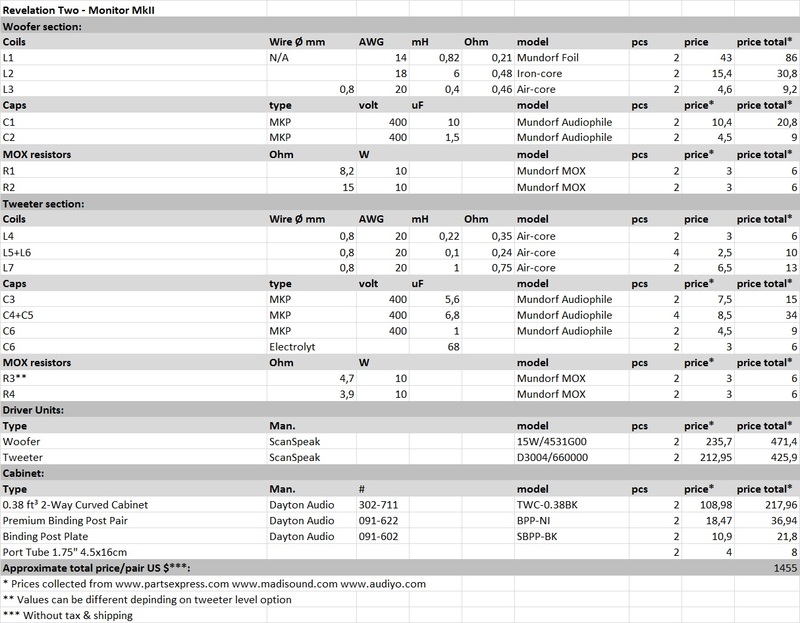 The Revelation Two – Monitor MkII uses two driver units from ScanSpeak. 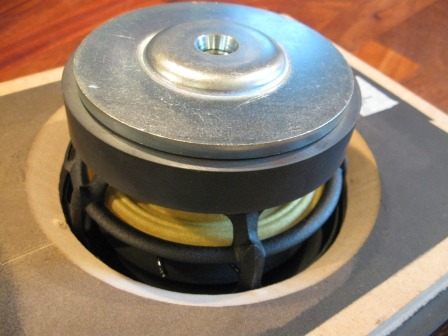 The mid-woofer section consists of the ScanSpeak 15W/4531G00 Revelator. 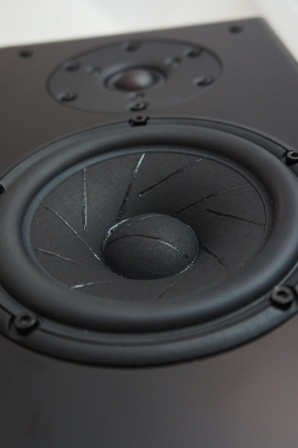 The 15W/4531G00 is one of the best mid-woofers available to the DIY market. It has a nice low extension and a very nice mid-range reproduction. The tweeter section consists of the ScanSpeak D3004/660000 Illuminator textile soft dome tweeter. This is a very low distorting tweeter and it has an extended frequency response in both ends. This tweeter is perfect for designs requiring a low cross-over point or as in this design a low-order cross-over with shallow cross-over slopes. Sonically the tweeter matches the Revelator mid-woofer beautifully and it has a neutral effortless sound characteristic and with great high frequency extension, but without ever sounding exaggerated or harsh. The Revelation Two – Monitor MkII uses an 11 liter “Dayton Audio” enclosure. This is a very nicely built curved cabinet with a 25mm (1″) MDF front-baffle. The enclosure walls are made of 18mm MDF as well as a 15mm brace from the bottom to the top. There are three different box tuning options in order to satisfy personal bass preferences and room setups. The closed box version has a surprisingly good bass performance when room gain is included. Option 2 goes remarkable low and sounds almost like a much bigger floor-stander. 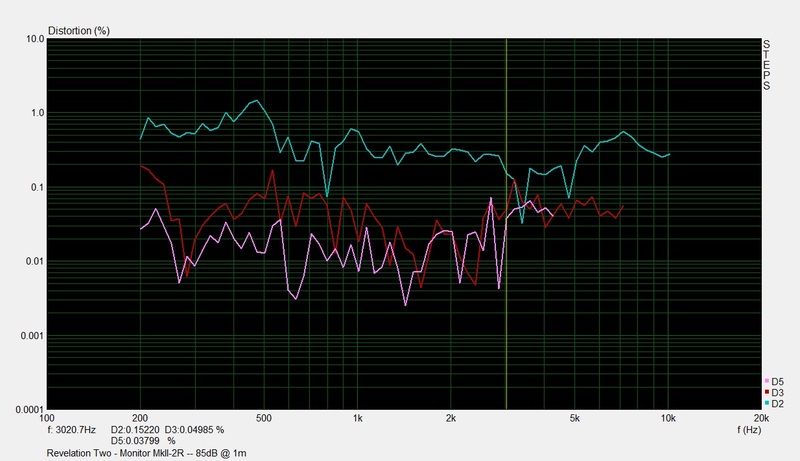 Option 1 used in this design has more mid-bass at the cost of low end extension compared to option 2. Any of these box tuning options can be used without compromising the design as long as the baffle width and driver unit lay-out is the same. The Revelation Two – Monitor MkII uses a true symmetrical second-order Linkwitz-Riley (LR2) filter topology. The most common way to address the driver units relative acoustic center off-set is to use asymmetrical cross-over slopes, but in this design I use an electrical way to time delay the tweeter to adjust the acoustical center off-set. This is done by using a “Ladder Delay Network” filter circuit, also often called an “All-pass Network”, “Lattice Network” or “Phase Control Circuit”. 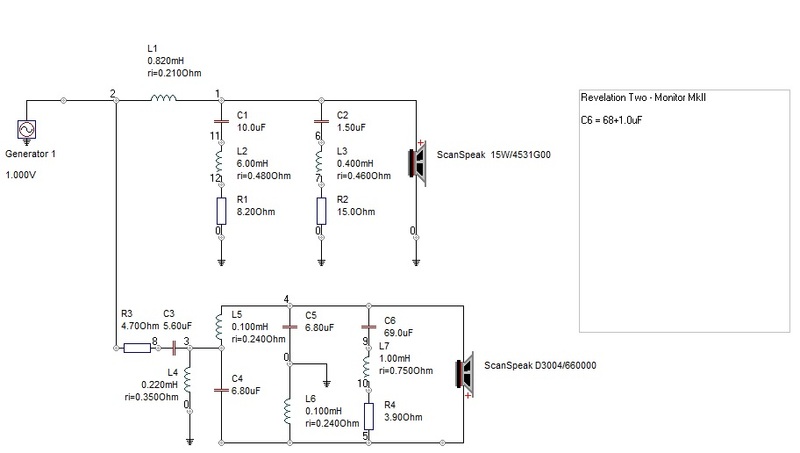 The mid-woofer cross-over filter section is very simple and consists of a large coil (L1) and two response shaping filter circuit (C1+L2+R1) and (C2+L3+R2) which shapes the cross-over slopes to a LR2 roll-off with a targeted 3kHz cross-over point. The large inductor (L1) tunes the design with a full “Baffle Step Compensation” (BSC). The effect of the response shaping circuits can be seen in this picture. Without the response shaping circuit (C1+L2+R1) the loudspeaker have too much energy in the mid-range and is too much forward sounding to sound natural. The tweeter cross-over filter section consists of a single tweeter padding resistor (R3) and a second-order electrical filter (C3+L4) that shapes the cross-over slope to a LR2 roll-off with a targeted 3kHz cross-over point. The value of (R3) can be changed to adjust the tweeter level to personal preferences. (C6+L7+R4) flattens out the tweeters impedance peak at the resonance frequency and it’s necessary to shape the filter to a LR2 filter slope, as well as to avoid “ringing” at the resonance frequency that could cause audible distortion. It’s ok to use a 68uF value for (C6) when using a high quality component or as in this design combine a cheaper electrolyte cap (68uF) together with a high quality 1.0uF cap. (C4+L5 and C5+L6) contains the “Ladder Delay Network” circuit that time delays the tweeter so its acoustic center off-set matches the mid-woofer and makes a perfect phase behavior around the cross-over frequency with minimal phase distortion. The tweeter is connected with reverse polarity and as can been seen in the schematics, the tweeter isn’t connected directly to ground. It’s of the outmost importance that the tweeter is connected exactly as shown, otherwise the delay network will fail. Top: Tweeter-axis, 15deg off-axis response. 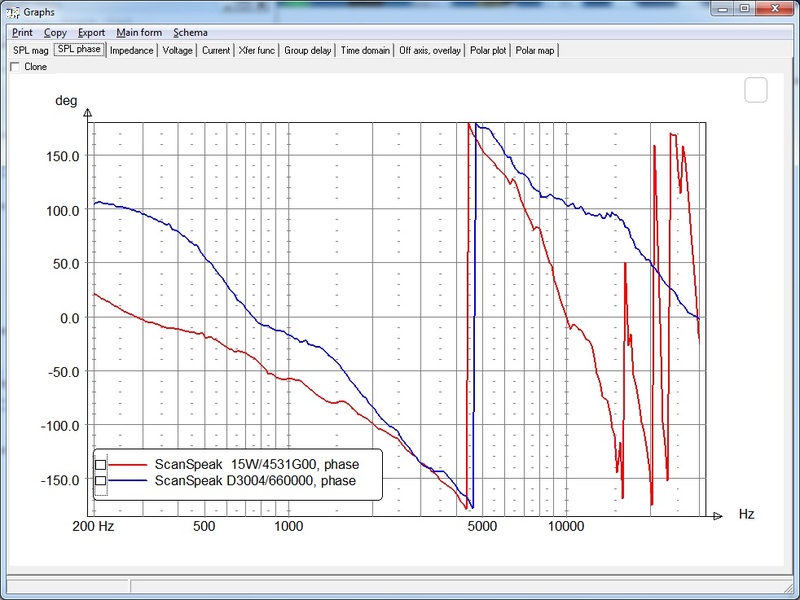 Left: Tweeter-axis, 15deg off-axis response, reverse polarity. The reverse polarity simulation shows a very deep reverse null indicating an excellent phase tracking between the two driver units at the cross-over point. 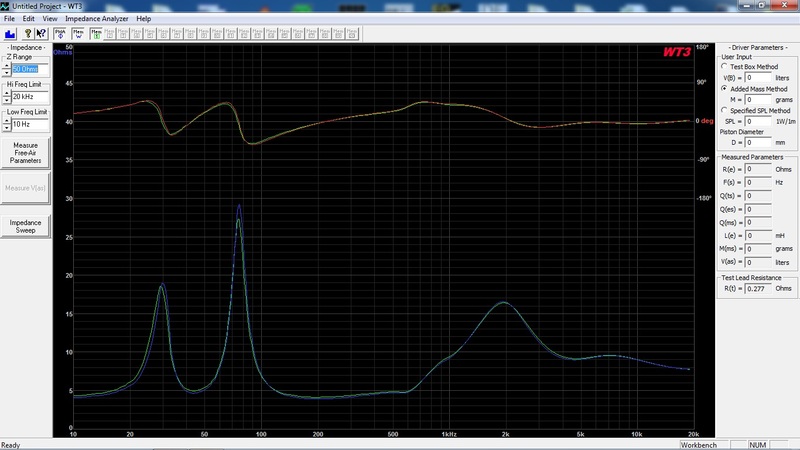 4 Ohm impedance minimum @ 200Hz. 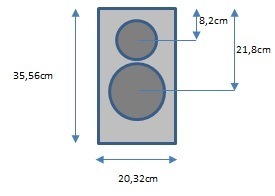 If nothing else is noted in the comments, the following frequency measurements of the finished loudspeaker are made at a 2m distance at tweeter height. All frequency response charts are presented in a 50db scale with 1/24 octave smoothing and the measurements are valid down to 400Hz. A very nice frequency response match between the two loudspeakers. 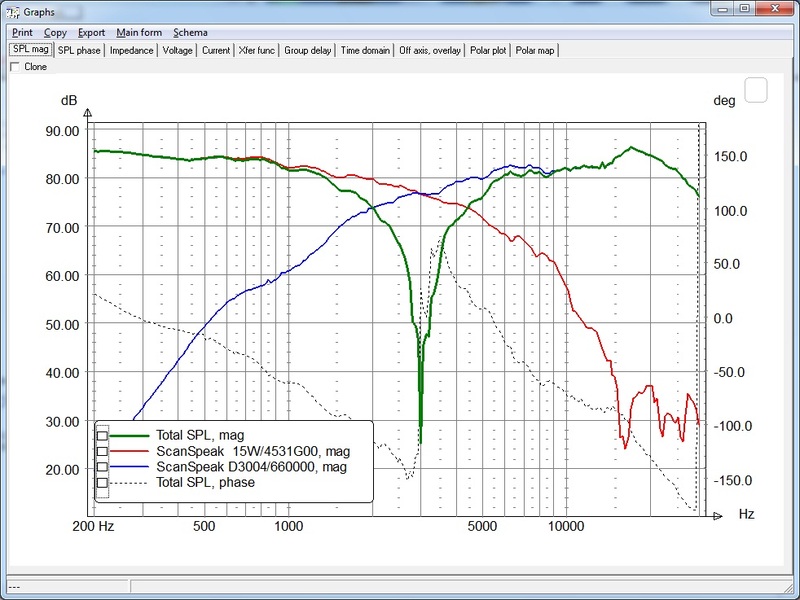 Left: Tweeter-axis @ 2m, 0, 15 and 22.5deg off-axis. 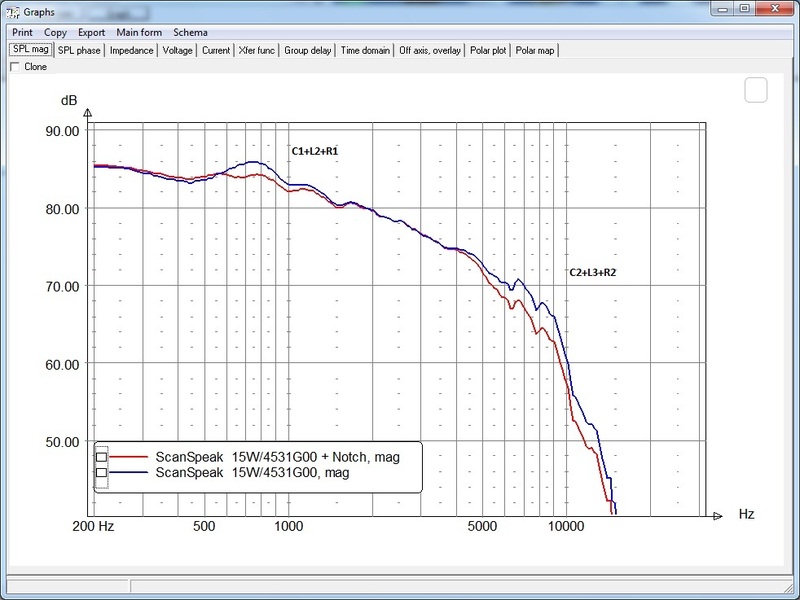 Right: Tweeter-axis @ 2m, 30, 45 and 60deg off-axis. The distortion measurements are done in near-field and the amplifier output level was adjusted for each driver so that the fundamental is 85dB, 90dB and 95dB at 1m. This setting simulates normal, medium and high listening levels. Somewhat elevated second-order harmonics compared to the very low odd-order harmonics. This is a low distortion loudspeaker, even at higher listening levels. The suggested components would cost about 1450 US$, but the cost can be reduced by choosing less expensive cross-over components and by building your own enclosures. 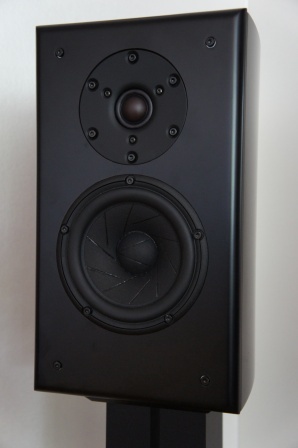 Even though the Revelation Two – Monitor MkII loudspeaker is a rather expensive DIY design it can compete with similar far more expensive commercial designs. It’s quite an investment, but well worth it. It shares many of the same sound qualities as the Sequence Two – Monitor loudspeaker design and it uses the same “Ladder Delay Network” technique to time align the tweeter with the mid-woofer. 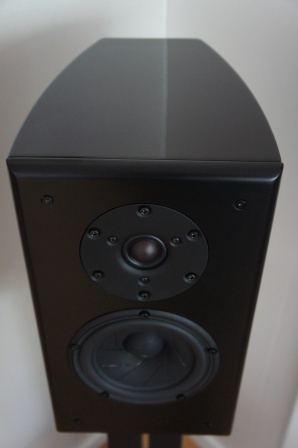 The Sequence Two – Monitor loudspeaker has a bit more micro detail and speed in its character compared to this design, but the Revelation Two – Monitor MkII mid-range on the other hand is a bit more “lush” or paper sounding in its character compared to the Sequence Two – Monitor’s more neutral sound reproduction. When using the ScanSpeak 15W Revelator mid-woofer in the smaller sized 11 liter enclosure you get a faster mid-bass articulation compared to the larger 14 liter option, which in turns digs a bit deeper at the cost of speed. To choose enclosure size is more a matter of personal taste and sound preferences. They are both very good options. The tweeter is well extended and neutral in its character. It never sounds harsh, exaggerated or tries to draw your attention from the music. The tweeter works in perfect harmony with the sound character of the mid-woofer and they are a perfect match to each other. With a well-made recording you are rewarded with a huge soundstage. Less good recordings are also enjoyable, since the loudspeaker is forgiving and non-analytic in its character. 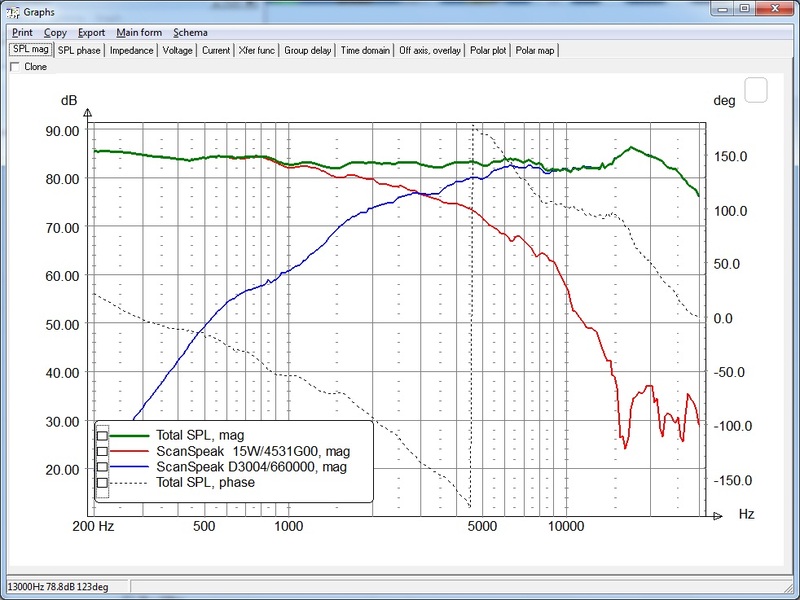 The loudspeaker is optimized for a listening distance of 2.5m, but everything between 2-3.5m works fine. As always it pays off to test different loudspeaker placements and see what fits the room and personal preferences the best.